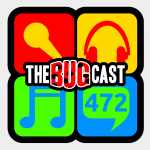 This week on The Bugcast: Chris and John from Canada dial back the chat, and play an amazing selection of 14 amazing tracks of independent and Creative Commons music! The next live show will be episode 473, which will be broadcast live in the chatroom on Friday 4 August 2017 at 21:30-ish UK time (BST/UTC+1). Chris & John for standing in for Dave & Caroline this week! Everyone who joined us in the chat room for the replay of this show.